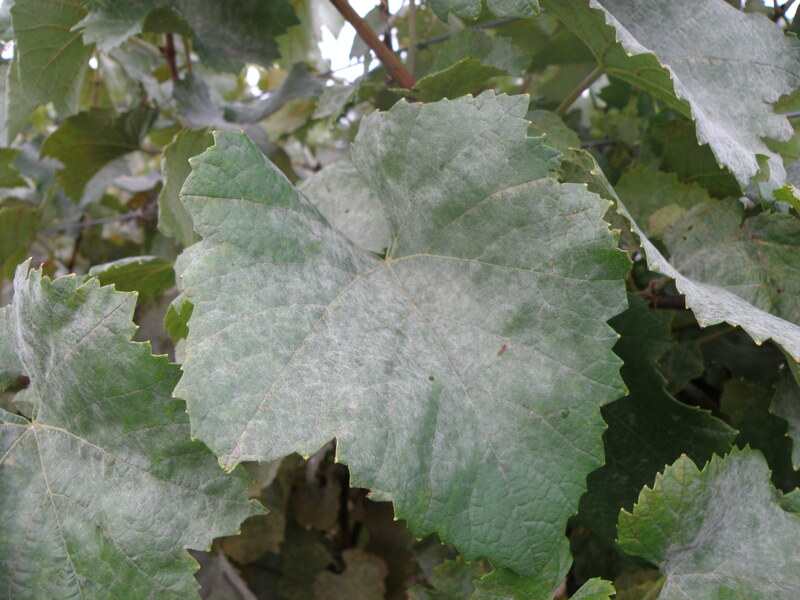 Powdery mildew, among winegrowers more known as Oidium, is caused by fungus Uncinula necator. The disease originates from North America, but is now widely spread among arid grape-growing areas around the world. Fungus can cause significant damages, it reduces the quality and quantity of the fruit yield, and if not properly controlled, it may even reduce the vine growth. Fungus Uncinula necator can infect all green parts of the grapevine. Infection usually appears first on the underside of basal leaves as a white powder. Later on, the fungus can cause mottling, curling and withering of the leaves. Eventually, leaves dry out and drop off. Symptoms of infection on green shoots appear as dark brown to black lesions. On the canes, an old infection appears as reddish brown areas. During the shoot period, petioles and other cluster parts can get infected through the season, and berries are more likely to get infected 3-4 weeks after the bloom. An infection on the berries can appear as white and powdery, or dark and dusty. Powdery mildew can result in shriveling or cracking of the berries, which then dry up, or never get ripen. During the summer, the fungus produces small black bodies on infected leaves, shoots, and berries, to overwinter. The pathogen overwinters as fungal fruiting structures (chasmothecia) on canes, fruits and leaves on the ground. In the spring, ascospores are released from the overwintering chasmothecia after a rainfall, and are carried to other grapevine tissues by the wind. The spores then germinate and cause primary infections. After the primary infection, fungus develops another type of spore conidia, which is spread by the wind to other plant parts where it causes secondary infections. 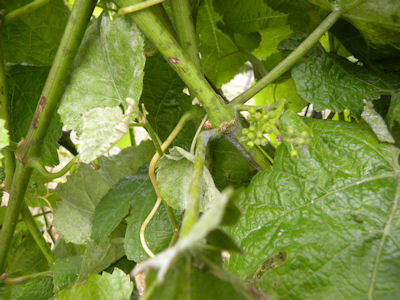 The powdery mildew fungus unlike black rot or downy mildew doesn’t require free moister for its infection and disease development, but relative humidity between 40 and 100% and temperatures between 6 and 32 ° C. Therefore powdery mildew can cause problems on grapevines also when it is too dry for the other diseases to develop. To manage powdery mildew, several cultural practices should be conducted. Some grape varieties are less susceptible to fungus than others. 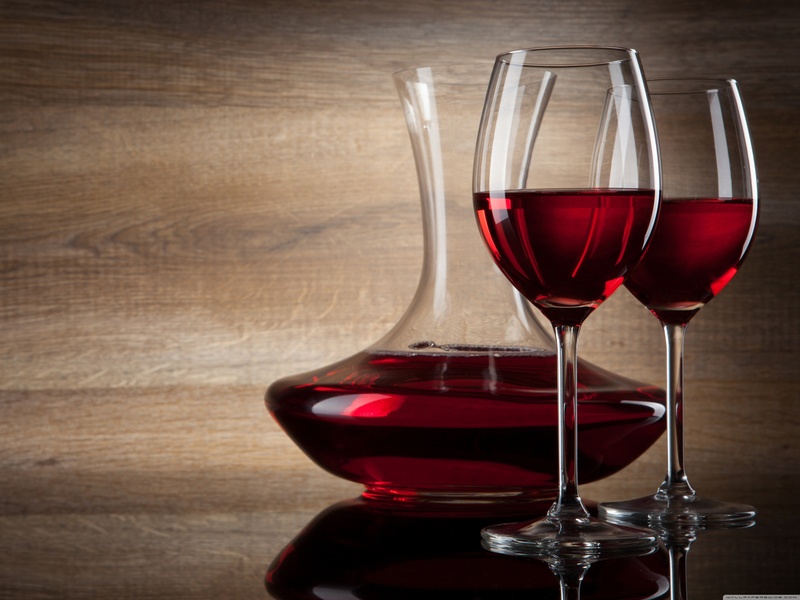 In general, the native American varieties are less susceptible than Vitis vinifera and its hybrids. Appropriate site selection and cultural practice that reduces humidity, enables good air circulation, and provides good light exposure, can make a big difference when managing the powdery mildew. Also all old disease plant materials should be removed and destroyed at the end of each growing season to prevent infections. 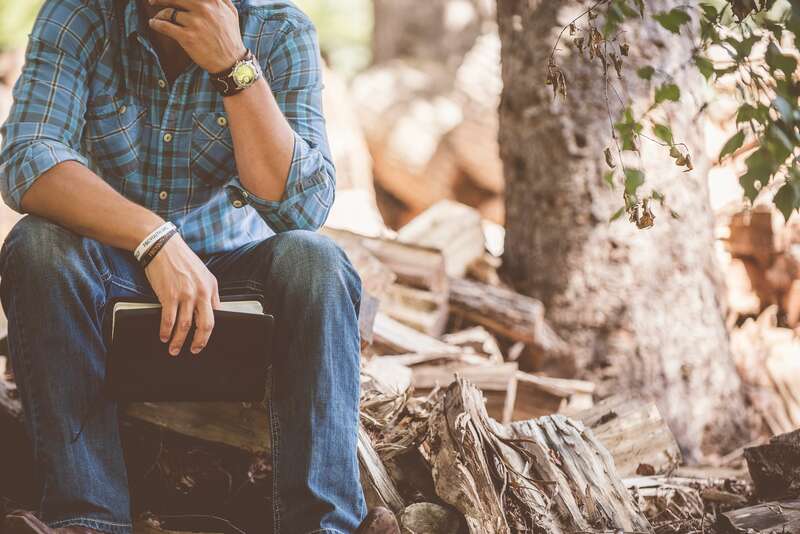 Unfortunately, many times cultural practices are not enough to fight the disease. There are several fungicides on the market that can be used against the disease. It is very important to control the early (primary) infection, because the failure of powdery mildew control can also result in increased levels of other fruit rots. 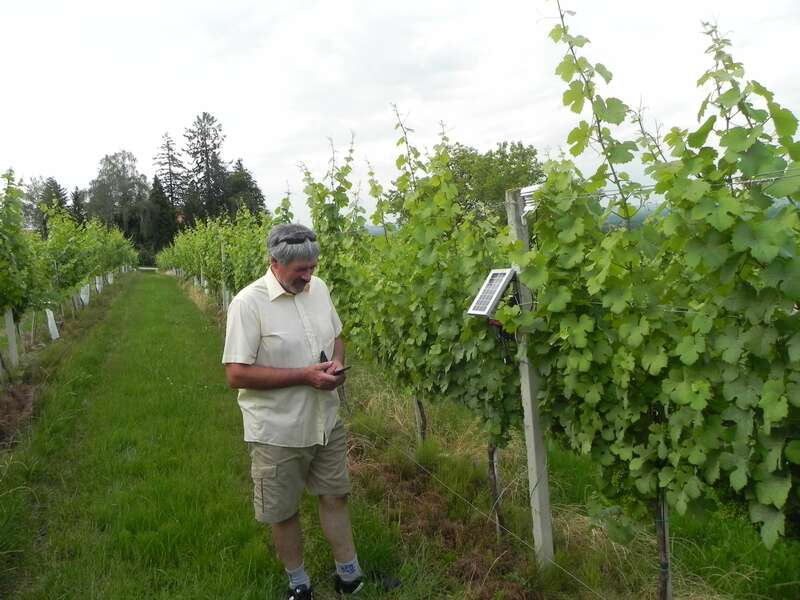 To determine the proper timing of fungicide application, winegrowers can help themselves with model driven decision support systems, such as eVineyard. 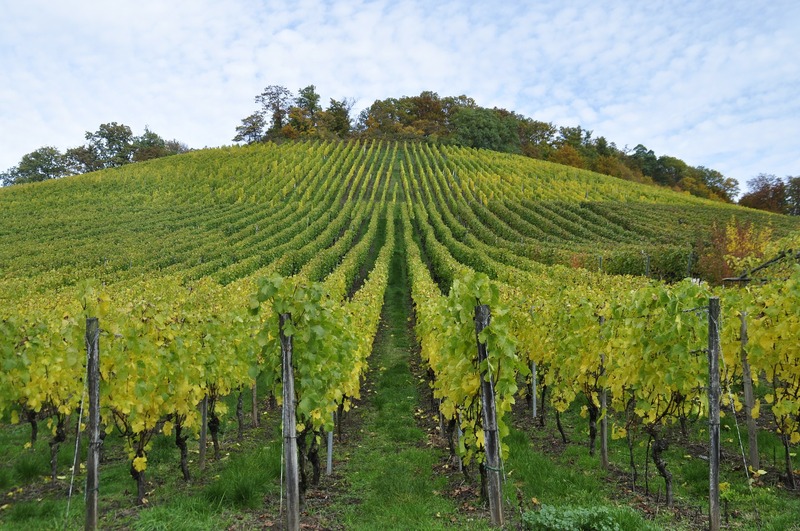 Winegrowers, how are you protecting your grapevines from Powdery mildew infection? Let us know in a comment below! i have a grapevine in the backyard , everything looks good, but the fruit when getting ripe it crack vertically like cutted by a razor blade; I wonder the kind of fungus is this. Hello Filiberto, powdery mildew can cause cracks on grape berries. If powdery mildew occurs on grapes in the phase of grape enlarging, it stops the growth and development of berry skin and hardens the skin. 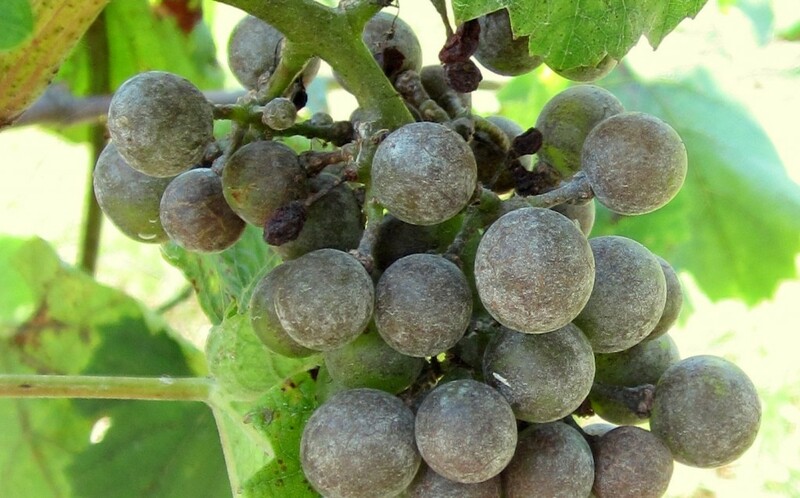 While grape berry flesh is developing normally, at some point due to the pressure on the “inflexible” grape skins, the grape crack. There may also be other reason to make the grape crack such as grape berry moth, birds, as well as bad weather i.e. rainstorms or hail during the berry ripening process. Hope this helps.